This dish is typically served during Filipino gatherings such as fiesta, birthdays or any holiday. Easy to make recipe and makes a good snack anytime of the day. 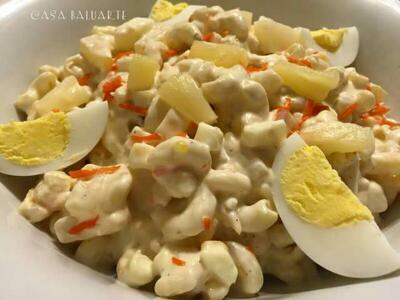 Using a big bowl combine macaroni, chicken, cheese, pineapple, carrots, relish, onion, eggs and toss. On a separate bowl mix mayonnaise, condensed milk, salt and ground pepper. Pour mayo mixture over the macaroni mixture. Toss till mixed evenly. 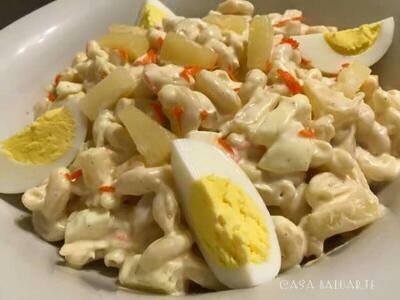 Transfer the chicken macaroni salad in a big tupperware and refrigerate over nite and serve.